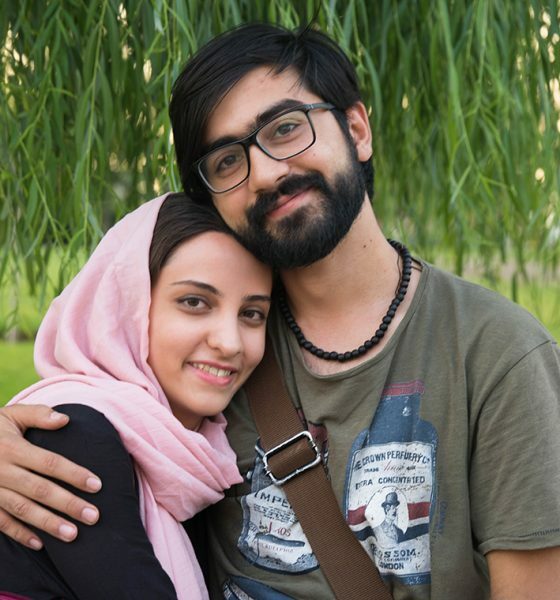 We spent two fantastic weeks in Iran. Not enough? Surely, a month or more would be better. However, we went very fast, so eventually it was two very intense weeks full of amazing experience. We landed in Mashhad from where we took a domestic flight to Shiraz. Then we continued by car through Persepolis, Yazd, Varzaneh. 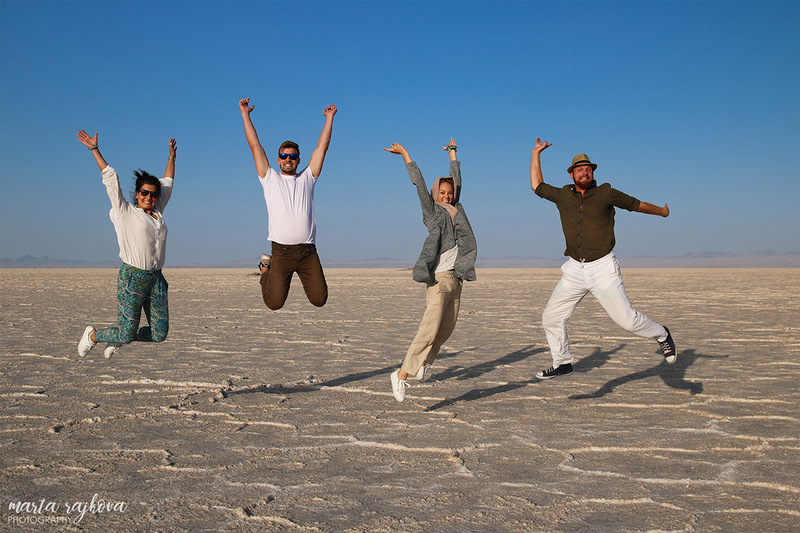 We travelled to Esfahan, Kashan by bus and then took a train to Tabriz. We discovered the region around Tabriz by car and then finished our trip in the huge capital, Tehran. Which places where the best? Every list of top-whatever-things is always subjective. So is mine. However, I think my list is a little bit different (and maybe more eloquent) compared to others that I have come across. I decided to pick particular places rather than whole cities. Why? Because even if there is an excellent must-see-thing in one city, the rest of it can be totally boring and unimportant. Ultimately, it is only up to you whether you go to such a city just because of one special spot. The absolute winner of my list of top things is Varzaneh. Haven´t heard of it? Me neither before planning my trip. 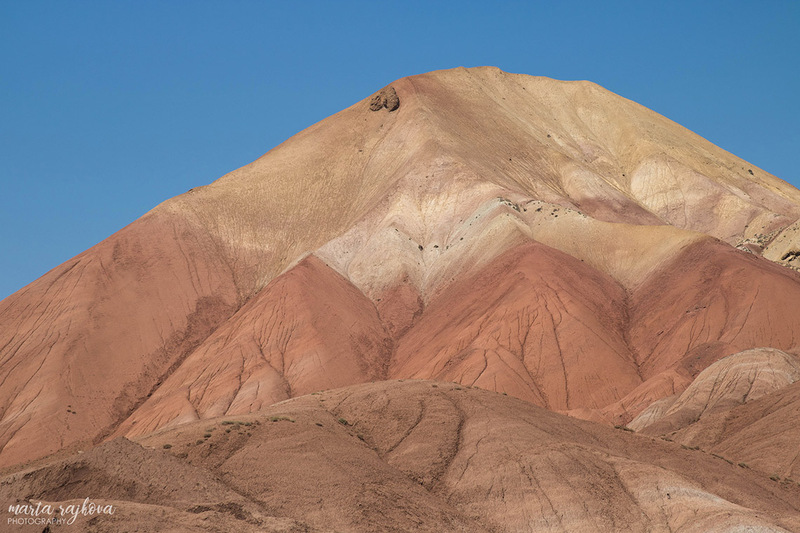 This desert town is off the beaten path and it is known for women wearing white chadors. You can see them on the street or meet them in the mosque. They are very kind and welcoming. However, it was the salt lake and sand dunes that were even more captivating. 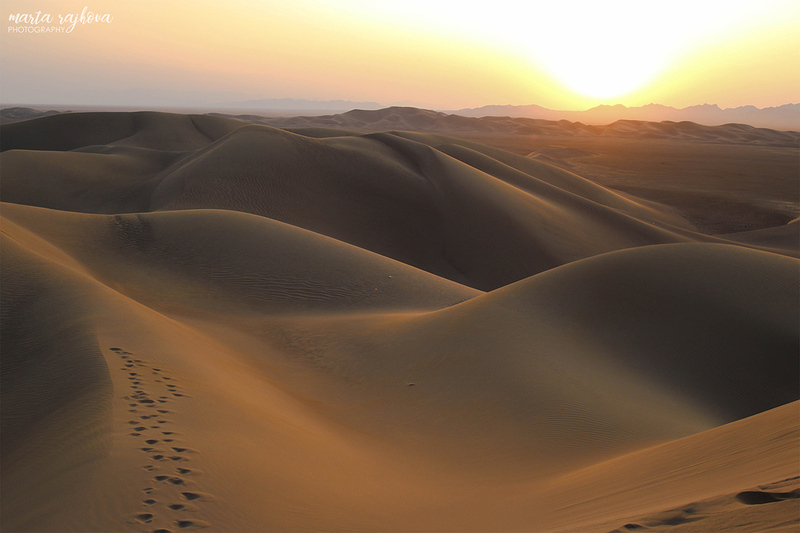 Walking bare foot in white salt surrounded by blue-white scenery and enjoying stunning sunset on the vast dunes is something that you should not skip in Iran. Girls, take off your hijab for a while and run down a dune in the evening breeze. Moreover, it is a perfect spot for stargazing. All this you can do within the afternoon tour organized by Negaar Varzaneh Traditional Guesthouse. 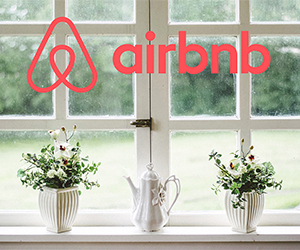 The guest house is nice and cozy, clean with tasty breakfast and helpful staff offering different kinds of tours. If you go there, please say hi to Mohammad, the owner of Negaar Varzaneh Traditional Guesthouse, from me. There is another nice place to see in Varzaneh – the Ghoortan Citadel. We got there kind of accidently as we met a superb guide, Khalil. He took us there and gave us a lovely tour. Khalil does many other tours as well and he works at Chapaker Traditional Guest House, so you can find him there. No, this is not a mistake. 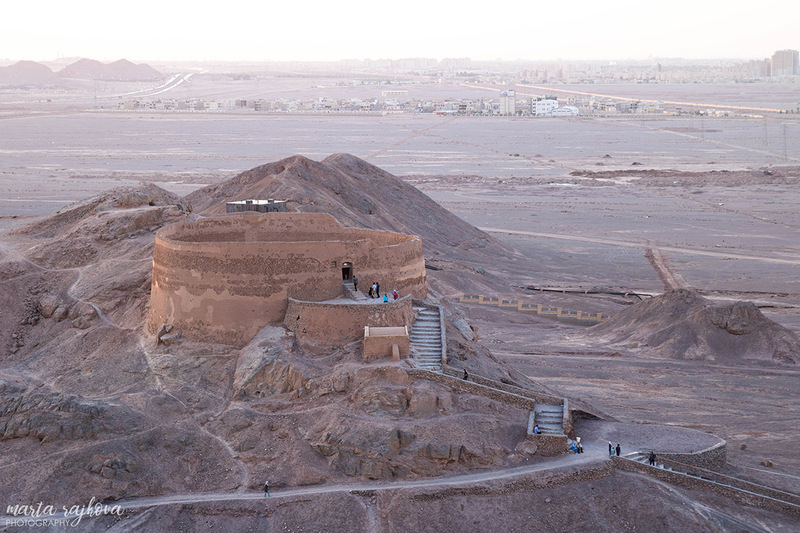 The little-known Tower of Silence is my second highlight of Iran indeed (even before the ancient Persepolis). Zoroastrianism itself is very interesting. However, standing on the top of this tower, also called dakhme (=last court), this ancient religion seems even more fascinating. As we were listening to the guide it all sounded so surrealistic. 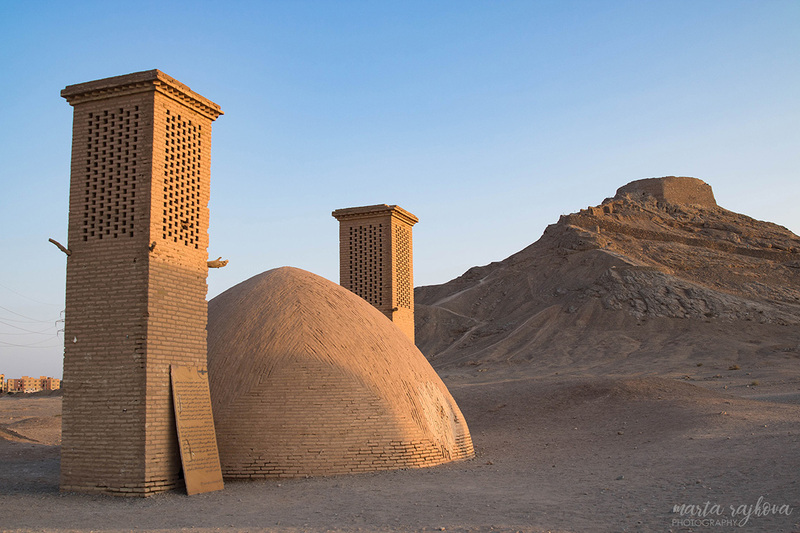 The Tower of Silence is located around 12 km from Yazd. Dead bodies used to be brought here until the early 70´s and left here in tree circles (kids, women and men) without being buried. Simply exposed to carrion birds. Only two men could enter – the nasasalars (=body carriers), because the view that was awaiting inside of the tower was extremely repulsive. A nasasalar lived at the root of the tower and he was a lifelong outsider. I should probably not tell you all the thrilling details. Come, see and listen to Zoroastrian practices and stories in this authentic place yourselves. Do not go there without a guide, though. Do not even think about it. It would be waste of time. 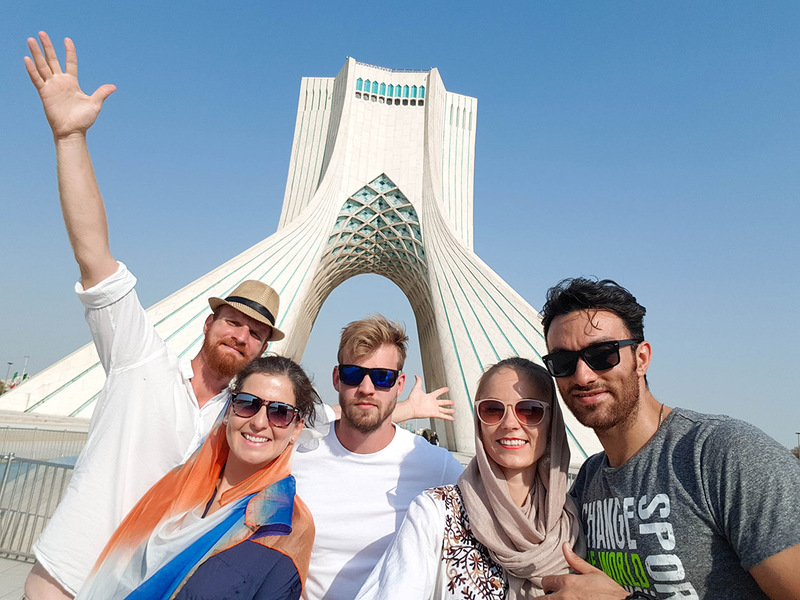 I recommend that you contact Behnam, who was our guide and I dare say one of the most distinguished tour guides I have ever met. He offers other tours around Yazd as well. You can contact him via his Facebook profile. 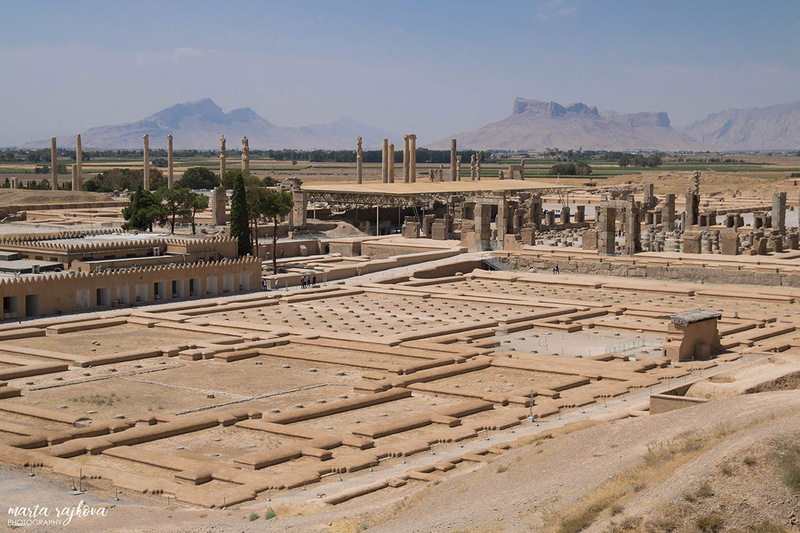 One of the very first things I heard about Iran was its fabulous city of Persepolis. I was imagining what it could look like and fantasizing that one day I might go there and see it. The fantasy came true and 20 years later I was walking between the ancient ruins, griffins, wall reliefs of men with curly beards and taking selfies in front of famous Persian kings´ tombs. Life is beautiful. 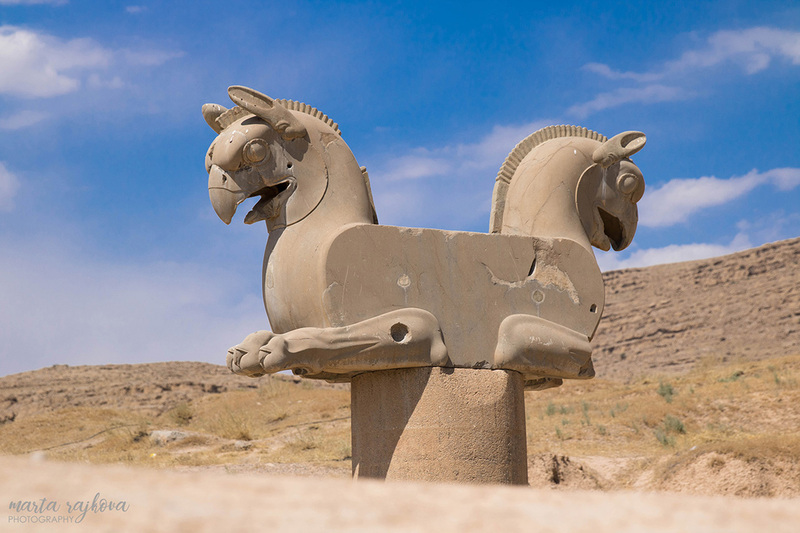 The distance between Persepolis and Necropolis (Naqsh-e Rustam) is about 12 km. I recommend visiting both. Persepolis is a 2500-year-old complex of ruins of royal palaces (of Darius I., Xerxes I., Artaxerxes I., Artaxerxes III. ), the Gate of Nations, treasury, throne hall and two tombs among other things. You need about 2 hours for this place. Necropolis contains only tombs. Tombs of the most famous Persian kings, though (starting from the left Darius II., Artaxerxes I., Darius I., Xerxes I.). You need about half an hour for this spot. To me, the most beautiful city in Iran is undoubtedly Yazd. I mean its old historical center, which is a labyrinth of narrow streets with arches. 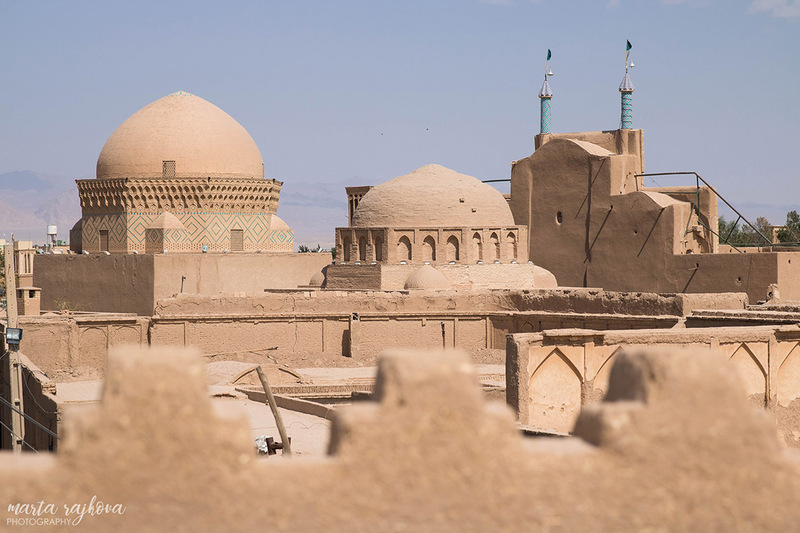 Some truly wonderful architectural masterpieces emerge between Yazdi houses built of clay and straw, such as the blue Jameh Mosque. 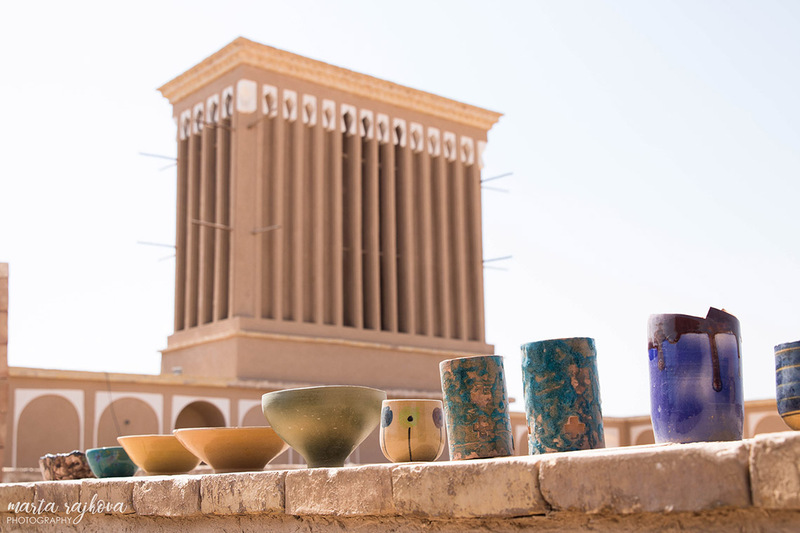 Another intriguing things in Yazd are the chimney-looking windcatchers that work as brilliant air-conditioning, also the Water Museum which explains everything about the 90 km long underground canals (qanat). Then you will start to understand the hardships of life in a desert. I am hundred percent sure you will love Yazd. Make sure you have at least two nights for this city. As to accommodation, I recommend Yazd Star Hotel. It is a very cozy and clean place, with a terrace and good breakfast. The staff that would make seriously anything to make you happy. Price is good, around 12,5 EUR/person/night with breakfast. If you wish to experience something really special, visit Yazd during Ashura, which is the tenth day of the month Moharram. (The next Ashura will be on September 21, 2018.). 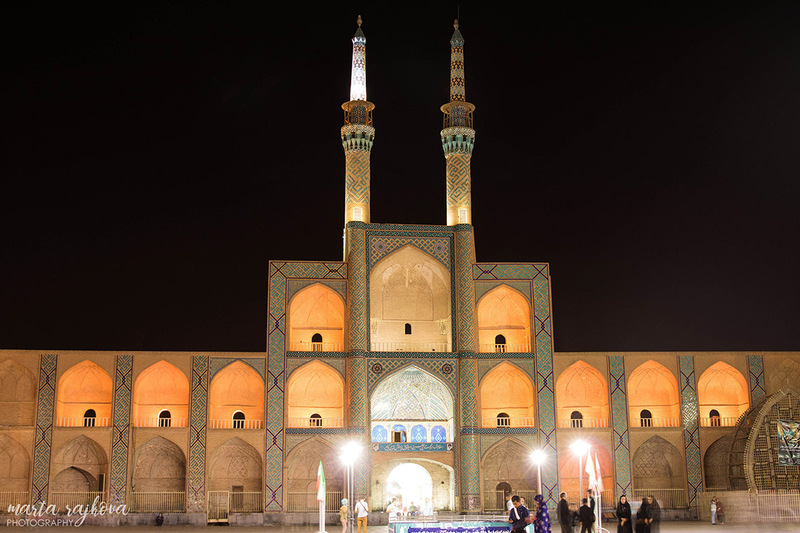 At the impressive structure of Amir Chaqmaq you will see a massive and emotionally touching ceremony commemorating the tragic death of Imam Hossein. The holy city of Mashhad is the second largest city of Iran and the most important pilgrimage place for Iranian Shias. It is the resting place of Imam Reza, Mohammad´s descendent, the only Shia imam (out of twelve) that is buried in Iran. Millions of pilgrims come here every year, some of them on regular basis. 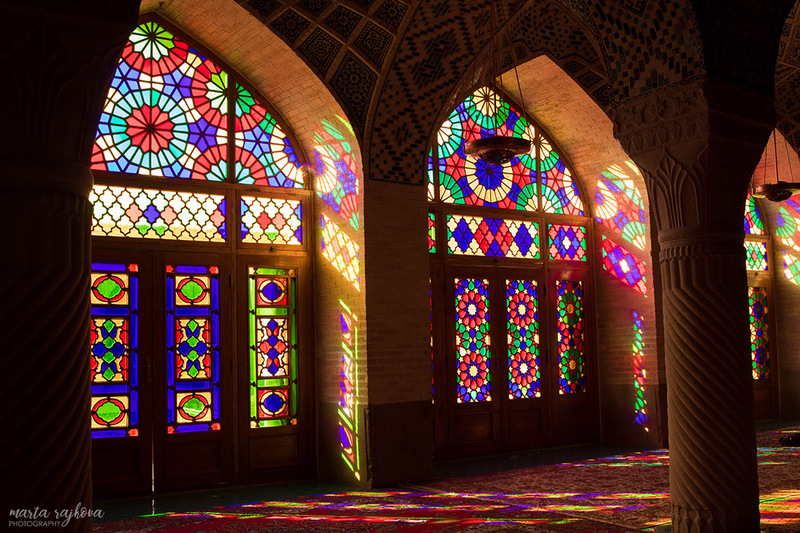 The complex called Haram contains an enormous mosque, blue domes, decorated walls, courtyards and fancy underground halls full of mirrors and jewels. Breathtaking indeed. However, even more captivating is the atmosphere created by the pilgrims. With prayers on their lips, tears in their eyes they express respect, sorrow and faith. Some others walk through the complex joyfully and take funny selfies. 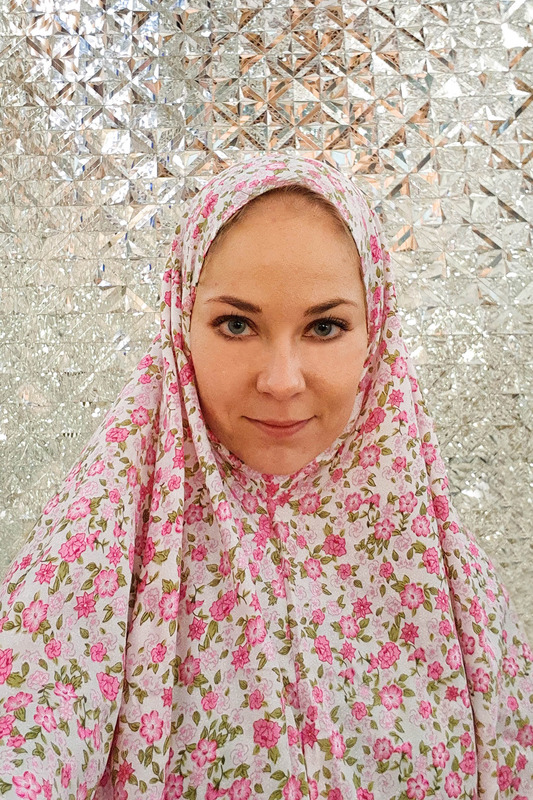 Another unforgettable, although not very pleasurable, experience for female Westerners is wearing a chador, which is compulsory within the complex. They will borrow you one at the entrance (not a black chador though, if you are not a Muslim). Backpacks, SLR cameras, video-cameras, selfie sticks are not permitted within Haram. Taking pictures and shooting videos is allowed with a smartphone. Do it decently, though. 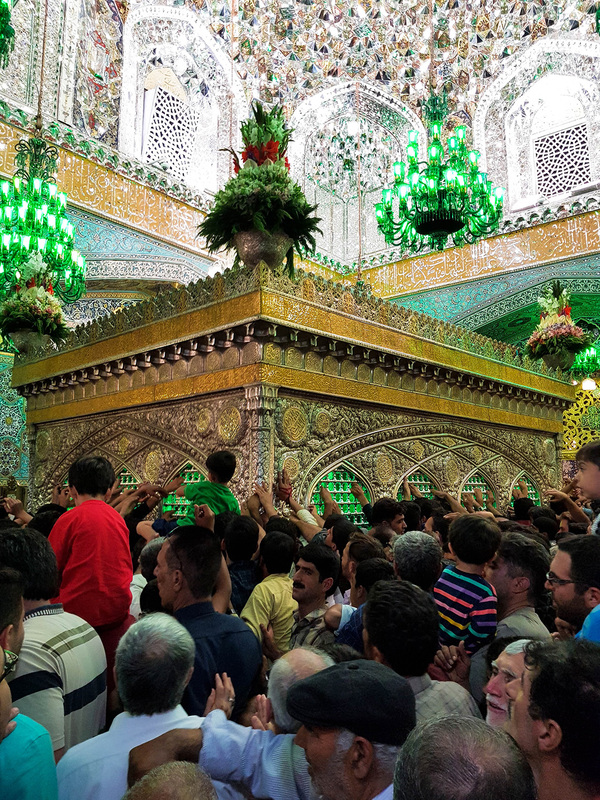 Then, within the Haram, there is the tomb of Imam Reza itself, which cannot be entered by Non-Muslims. I am wondering what you will think of the atmosphere of this holy place. The 20th century Iran was full of stormy moments and radical changes such as for example the Islamic revolution starting in February 1979. 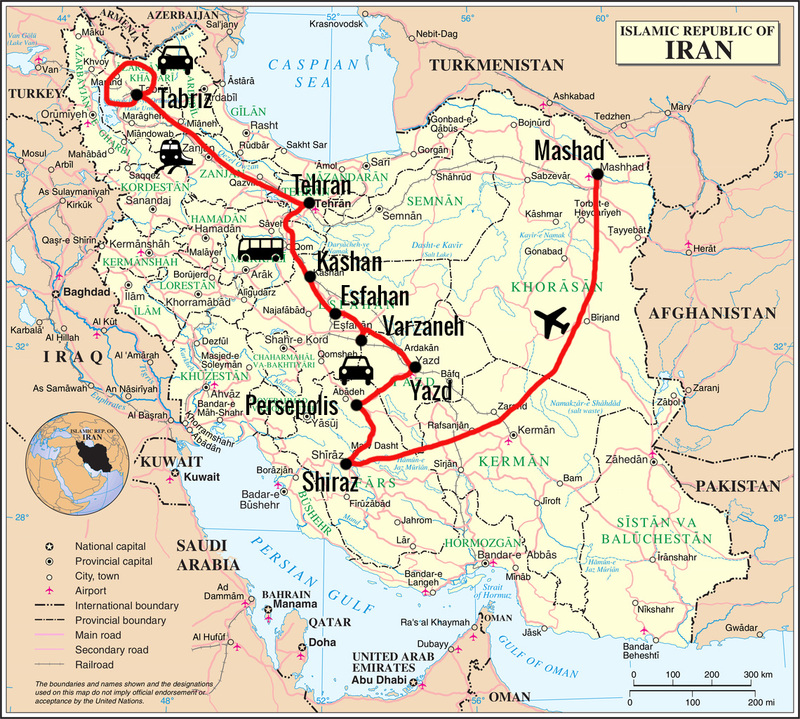 As its result Shah Mohammad Reza Pahlavi fled the country and the Islamic Republic of Iran was established with supreme leader Ayatollah Khomeini in charge. 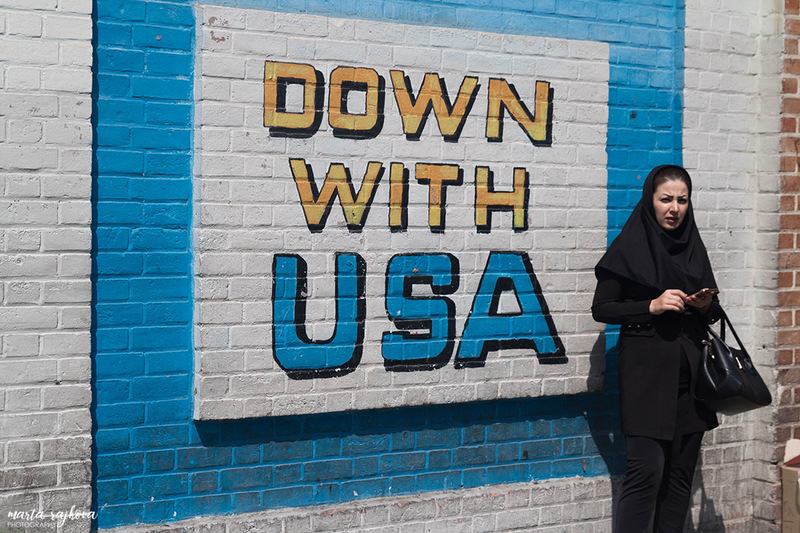 The chasm between the West and Iran was growing. 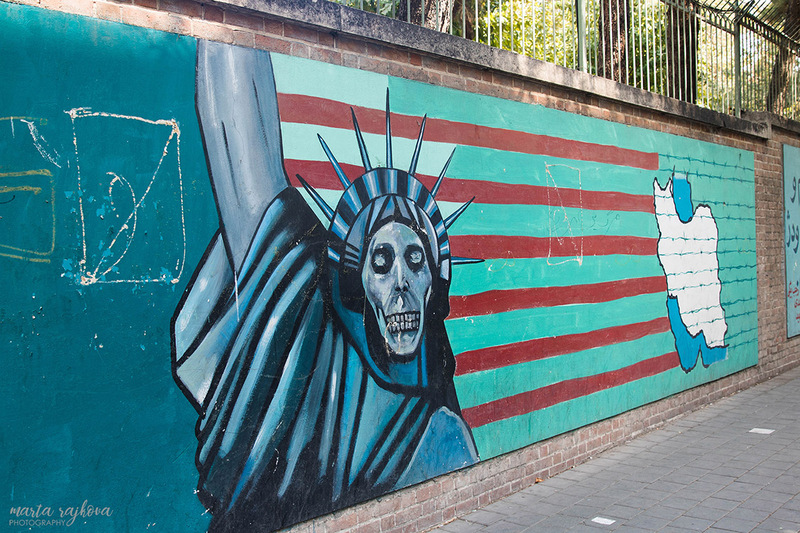 In November 1979 Iranian students stormed the Embassy of US in Tehran. 52 diplomat hostages were held there for 444 days. This incident was a start of a long enmity between the two nations. The diplomatic relations have not been reestablished ever since. The former embassy, locally also called “den of espionage” or “nest of spies”,, is a magnet for tourists of all nationalities. For years you could only see the walls that are covered with anti-US graffiti. Since 2017 it is finally open to public as a museum. They offer a free guided tour that is quite suggestive in fact. Therefore, I recommend you read before you go. An excellent overview of the 20th century events is Ryszard Kapuscinski´s book: Shah of Shahs. From outside the Pink Mosque (also known as Masjed Nasir-ol-Molk) looks nice but rather conventional. What draws hordes of visitors here is the interior that comes to life with the sunrise or even later, around 8.30 AM. 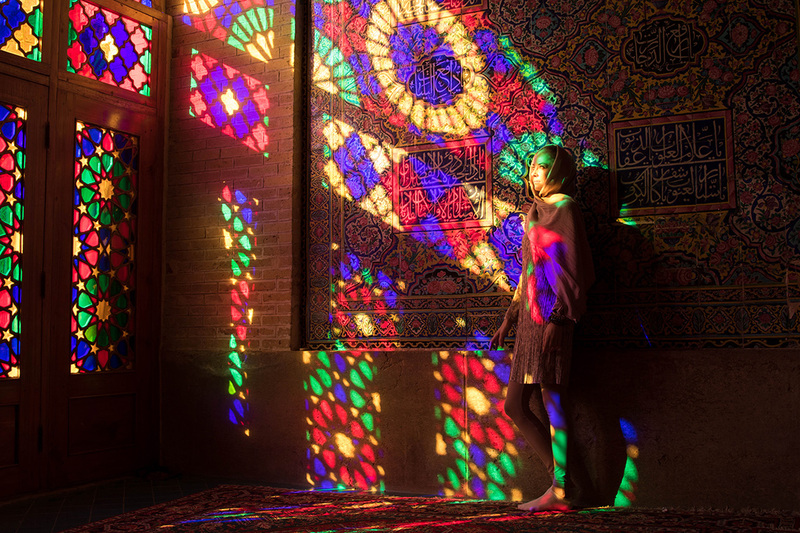 As light shines through the colorful window panes, it reflects on the decorated Shirazi carpet, walls and arches turning the room into a fantasy world. However, forget about enjoying this exciting play of colors alone. 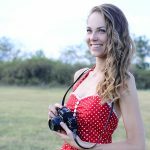 You will have to be very patient if you want a few nice photo shots, as there will be another at least 20-30 lovers of colors with you inside. Besides the Pink Mosque we were not too impressed by Shiraz itself. 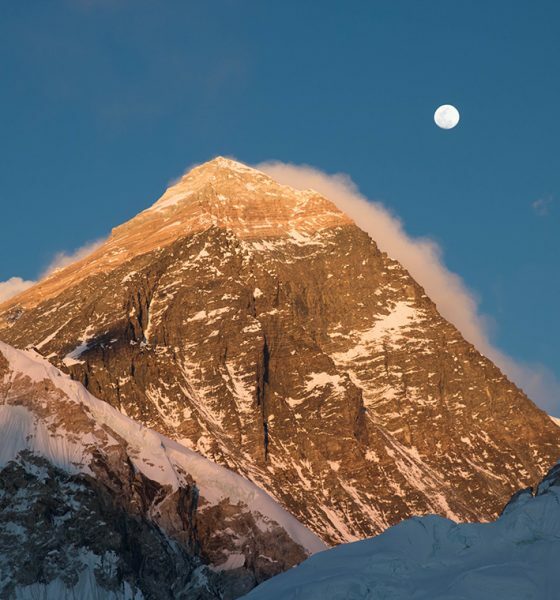 The question is whether it is worth coming here just because of one impressive sight. Photographers will enjoy it. Others should consider it depending on how much time they have. 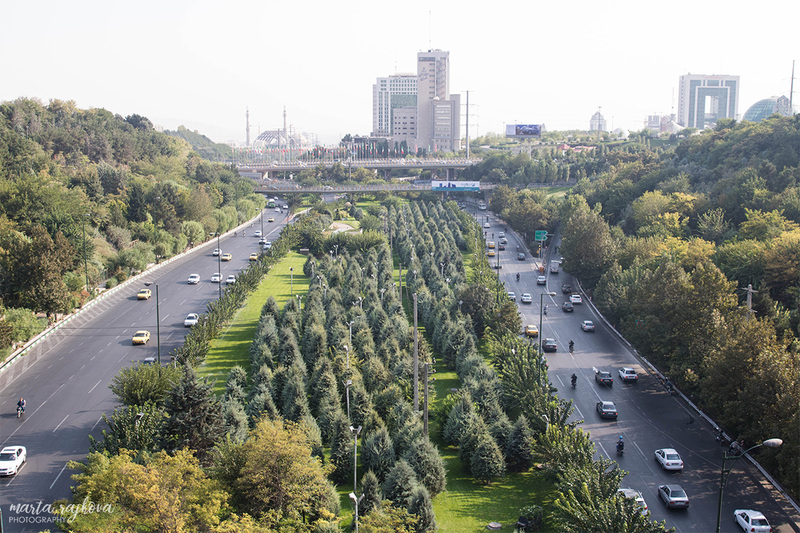 Tehran is a huge city suffering from traffic jams and smog. A fantastic place to get away from this busy hell is the Tabiat (=nature) Bridge. 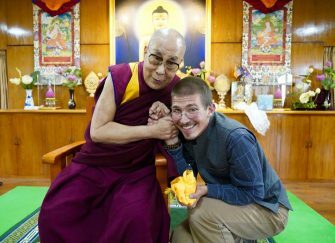 It is evidently popular among both, locals and tourists. The bridge connects two parks, moreover, on one of the sides there is also a huge food court with delicious – not only saffron – ice cream. The place has striking atmosphere and becomes very busy at night. Great place to hang out with friends or family. 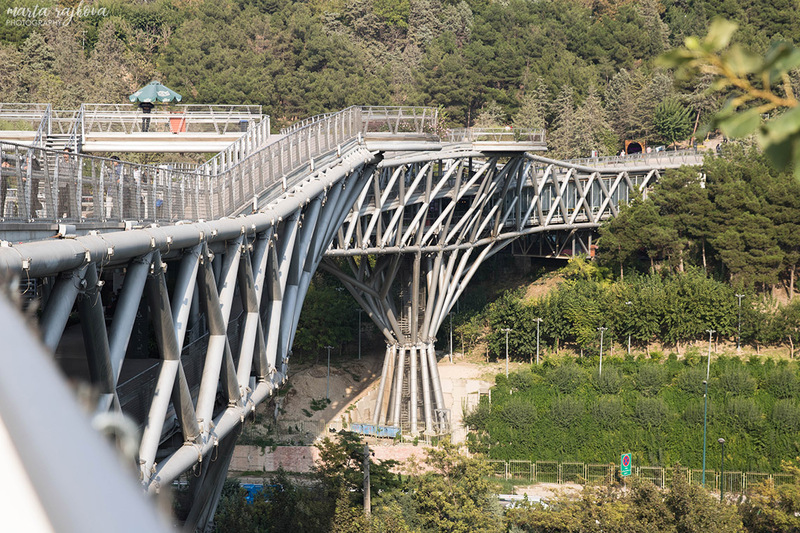 The bridge itself is built above the wide Modares highway, but the area is as green as possible. Fantastic architectural work indeed whose author is a young architect Leila Araghian. 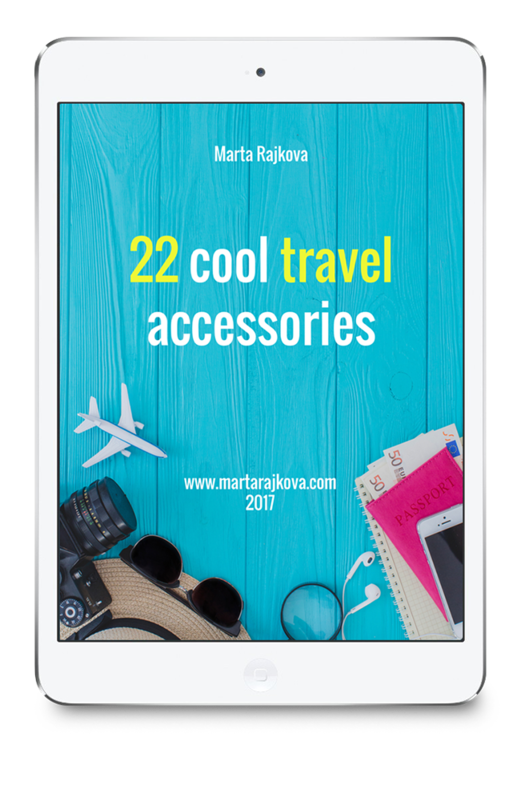 She designed this unique project while being a student. A few years later, at the age of 31, her plan came true. 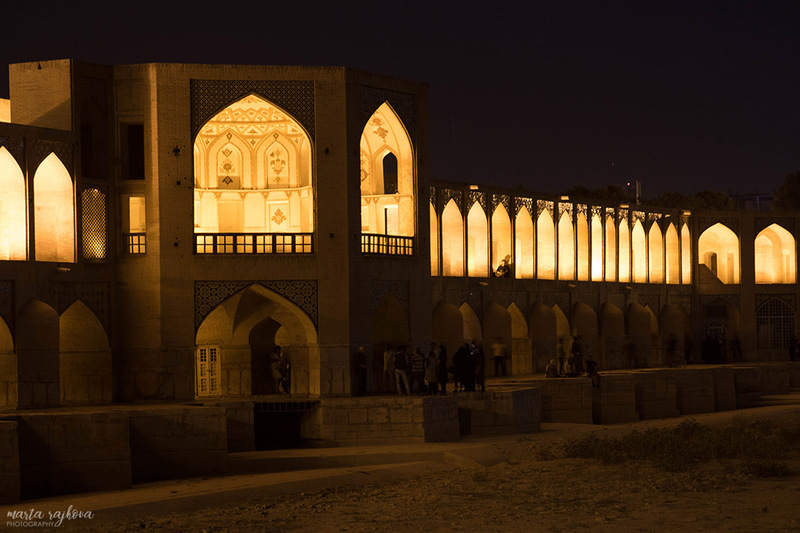 Esfahan is well known for its bridges with terraced arcades built on the Zayande river. The sad part is, that the river is often waterless. That was the case when we visited Esfahan. Nevertheless, the bridges are busy and full of people at night. Apparently, they are popular meeting spots. The Khaju bridge is a special one among the bridges. Every evening after sunset its lower arcades become a place of spontaneous concerts. 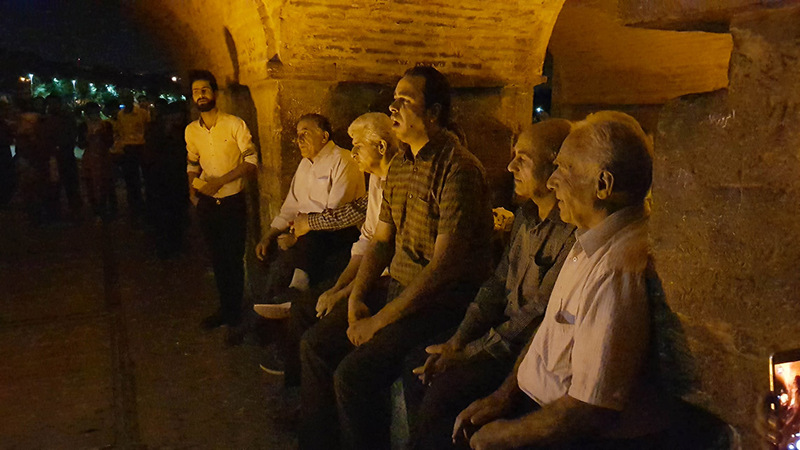 Approaching the Khaju bridge you will hear male voices singing emotional Persian lyrical songs, solo or together, but always impressive. You can rarely see such a thing in other cities of the world. 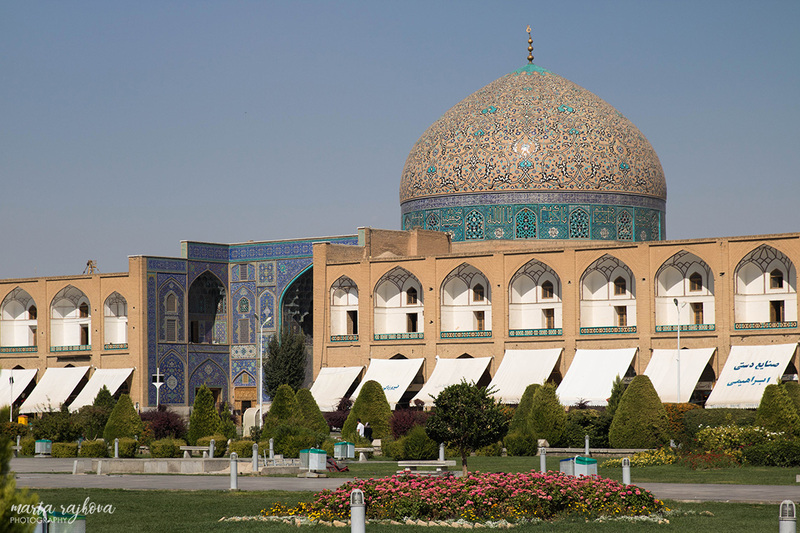 Esfahan can be proud of its huge Imam Square (Naghsh-e Jahan) that is one of the largest in the world. It is 512 meters long and 163 meters wide. It is bordered by two-story arcades filled with shops and continuing into a bazaar, anchored by the Shah Mosque (Masjed-e Shah) and the Sheikh Lotfallah Mosque among other significant buildings. No wonder the square is UNESCO-listed. However, I put in on the 10th place, because it simply did not overwhelm me. Maybe I read too many blogs and guide books that laud Esfahan and its square to the skies. Also, the Shah Mosque was under construction which decreased the good impression a little bit. On the other hand, what I really liked was that locals sat in the grass chilling and having picnic, which gave the place a very charming atmosphere. At night the lights go on, people gather around the fountain and the whole square becomes lively. 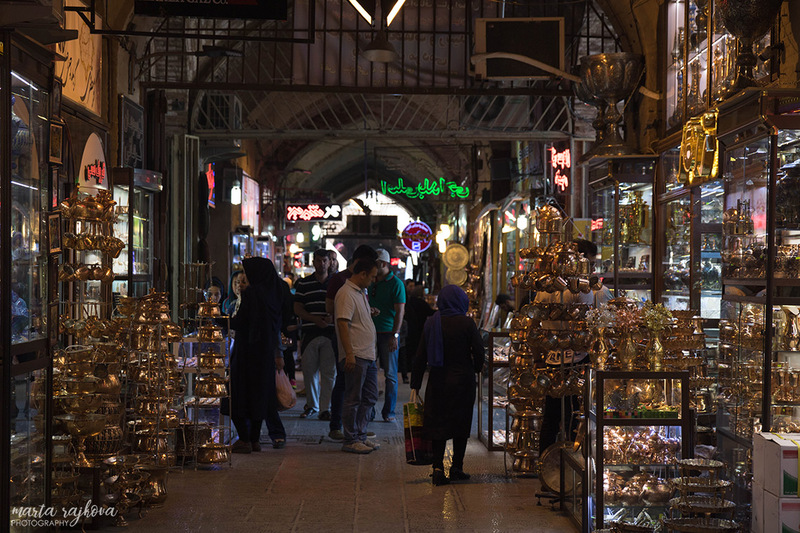 In every large city in Iran you will find a bazaar (Tehran, Tabriz, Esfahan, Kashan, Kerman, Shiraz), mostly with arched passageways. 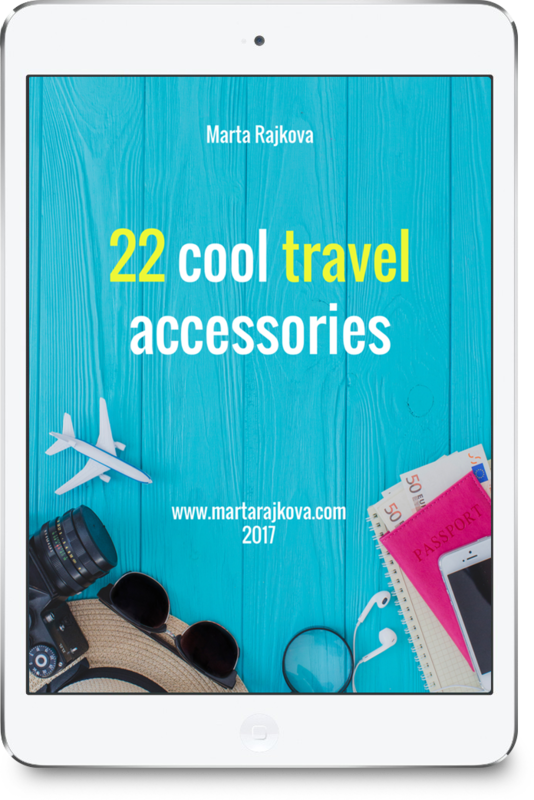 You should include into your itinerary at least one of them and buy some date, halva or saffron. I think the bazaar in Esfahan linked to this square was probably the most lively, stylish and appealing in Iran. 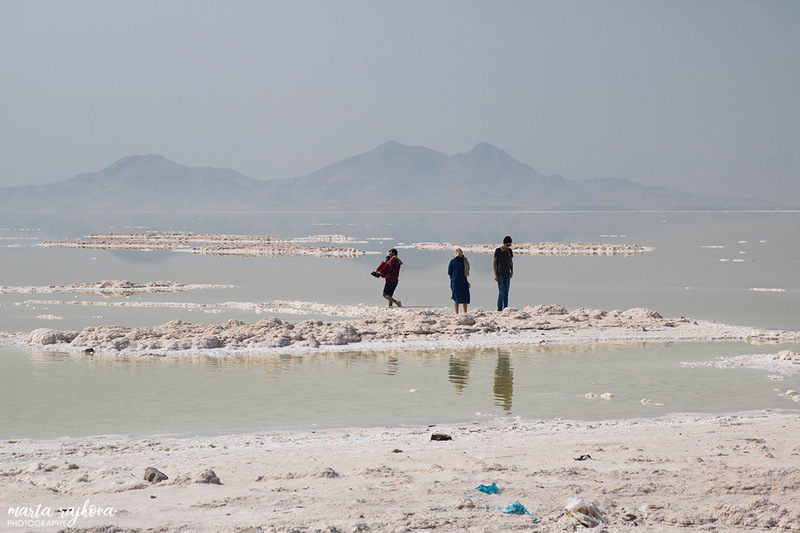 Urmia is a giant salt lake in northwest of Iran. Well, it used to be giant. Originally with length of 140 km and width of 55 km it was the sixth-largest saltwater lake on Earth. Unfortunately, by now its surface has shrunk to 10% of its former size due to pumping of groundwater from the surrounding area among other reasons. Changing cabins are standing abandoned on the shore, as the water is gone. 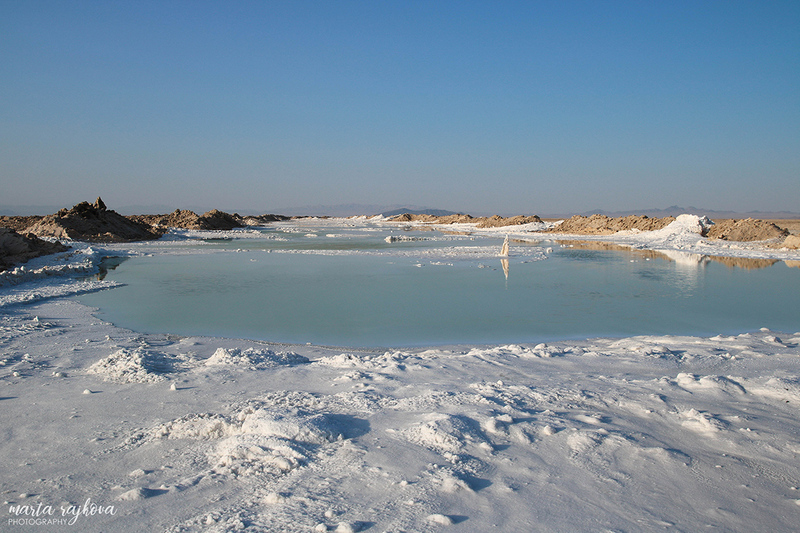 Only salt and white surfaced water due to the high concentration of salt. Locals bathing, wearing cloths, of course. It is a sad, though nice picture. 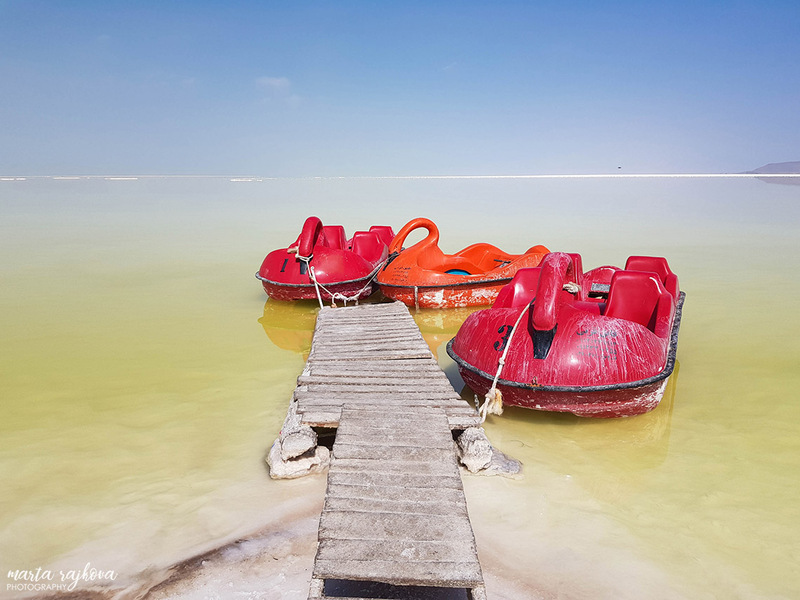 Jump into a swan-shaped pedal boat and have a bizarre tour on Lake Urmia. Apart from the tragic fate of the lake, one thing that is disturbing is garbage. 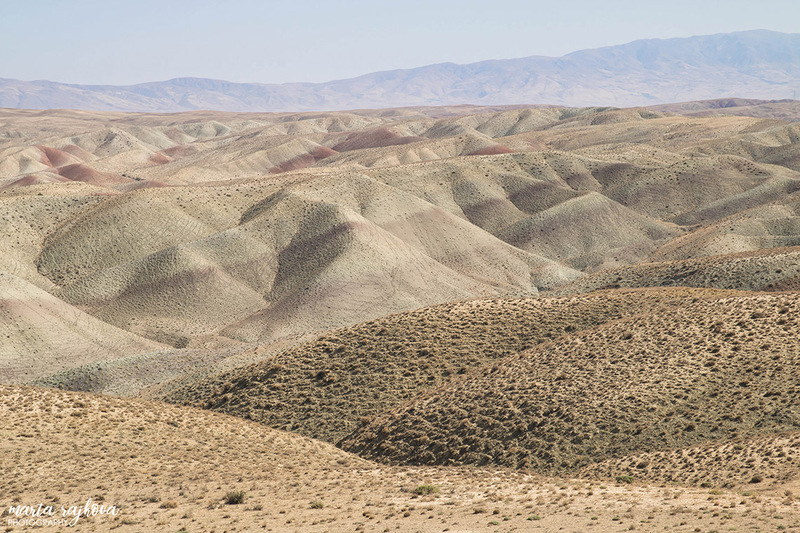 About 40-50 km northeast from Tabriz in East Azerbaijan province you can see colorful hills. It is a genuine natural jewel, a mix of many colors such as copper red, orange, yellow, brown and green. Rent a car with a local driver who knows exactly where to take you. You will be flexible and able to stop wherever you want. 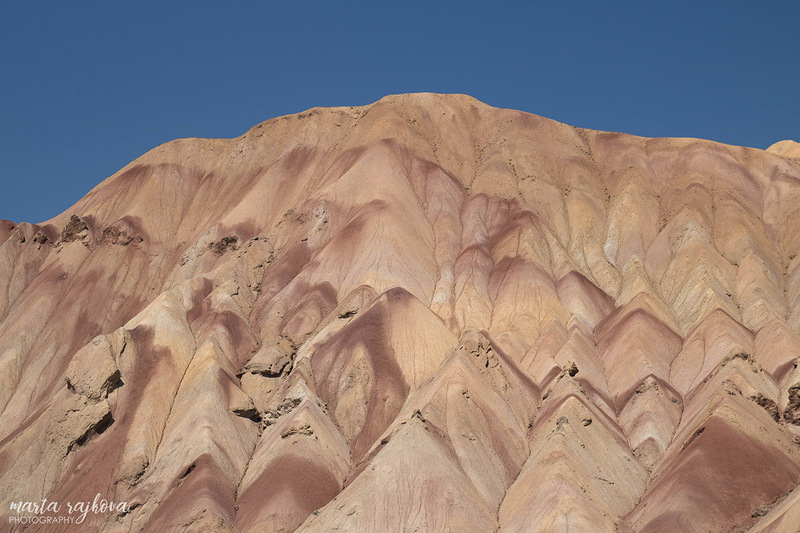 If you want to see these hills and/or anything in the region around Tabriz, I recommend our awesome driver Farshad. You can contact him via his Facebook profile. Don’t fool yourself, though. The mountains are nice, but some photos you find on the Internet might be oversaturated. Allegedly, the colors are the best in spring. Would you believe that in a Muslim country you come across a precious medieval Christian sight? 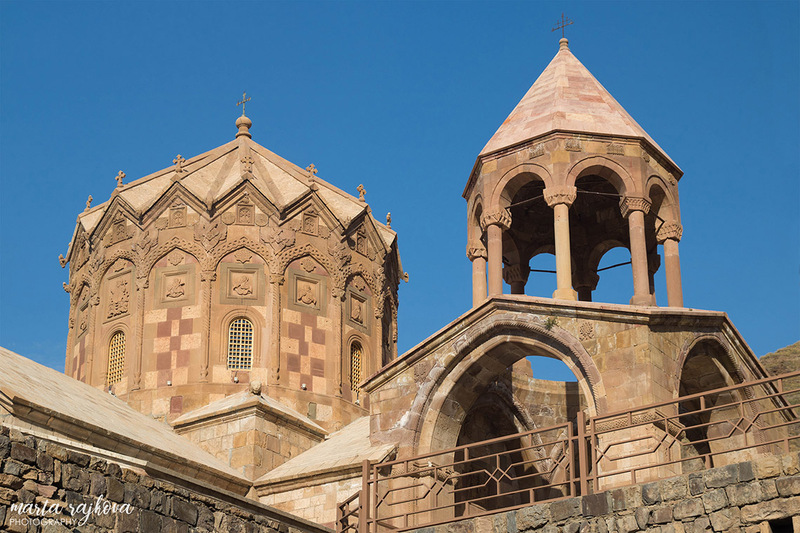 In the far northwest of Iran, on the Azerbaijani border around 17 km from Jolfa, there is a UNESCO-listed Armenian Church. Its oldest preserved parts date back to the 13th-14th centuries. However, allegedly there was a church established by St. Bartolomew the Apostle much earlier – around 62 AD. 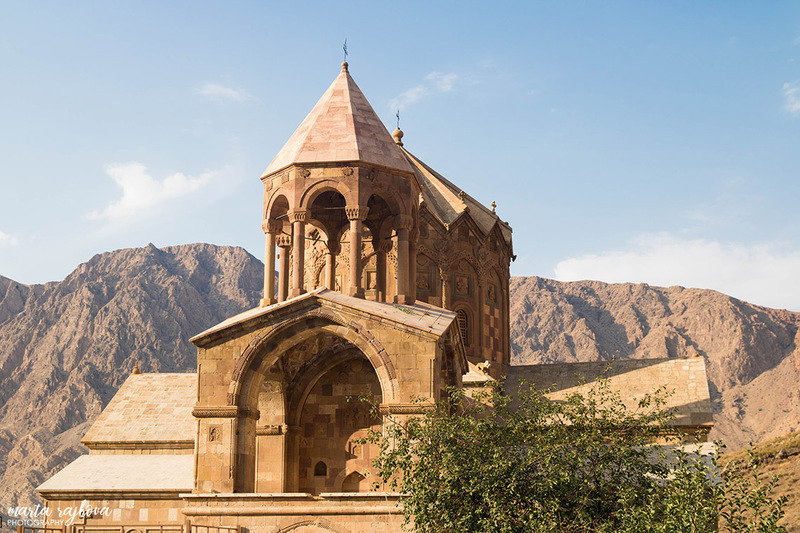 The monastery is rare not only due to its age, but also because it survived so many thorny moments of the past (for example interventions of Seljuk Turks, Mongols, Russians). The interior is nicely decorated with angels and Armenian crosses, but it is under long term restoration. There is just one bizarre thing about this monastery: Ayatollah Khamenei´s picture welcoming you at the entrance. 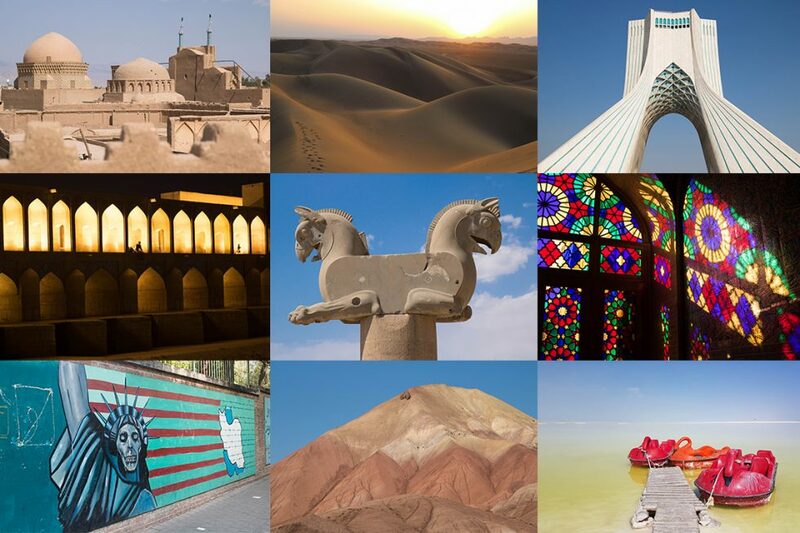 Iran´s architecture is not only about mosques, minarets and lovely Persian mosaic. About 55 km from Tabriz in East Azerbaijan province there is a small village known for its unique dwellings. The houses are excavated inside volcanic, cone shaped rocks and they are still inhabited. 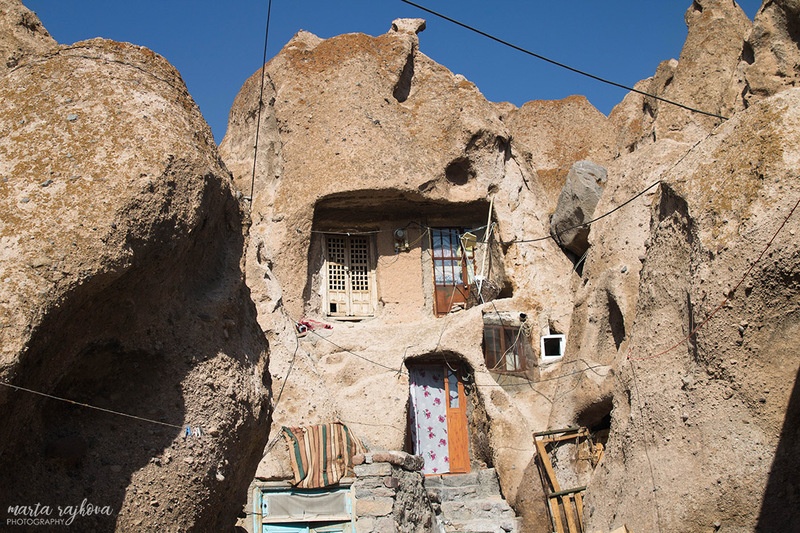 The place is obviously quite touristy, as the troglodyte homes are rare and remarkable. 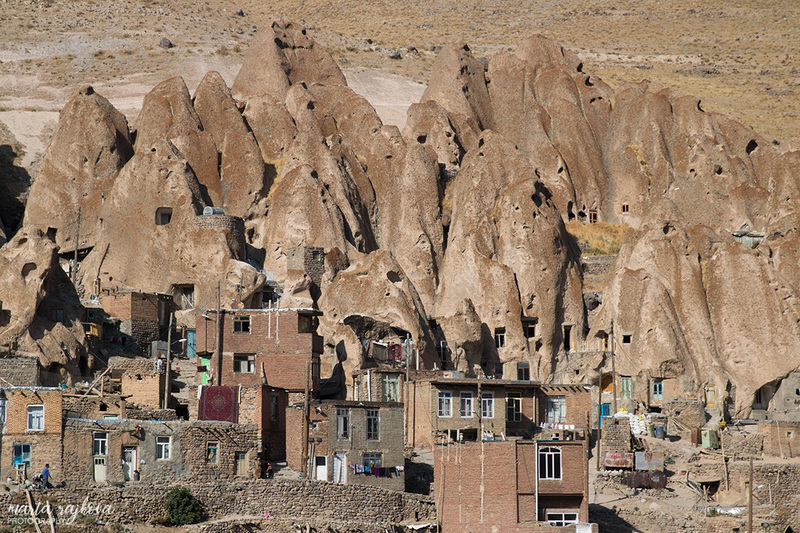 Similar dwellings exist in Cappadocia, Turkey. 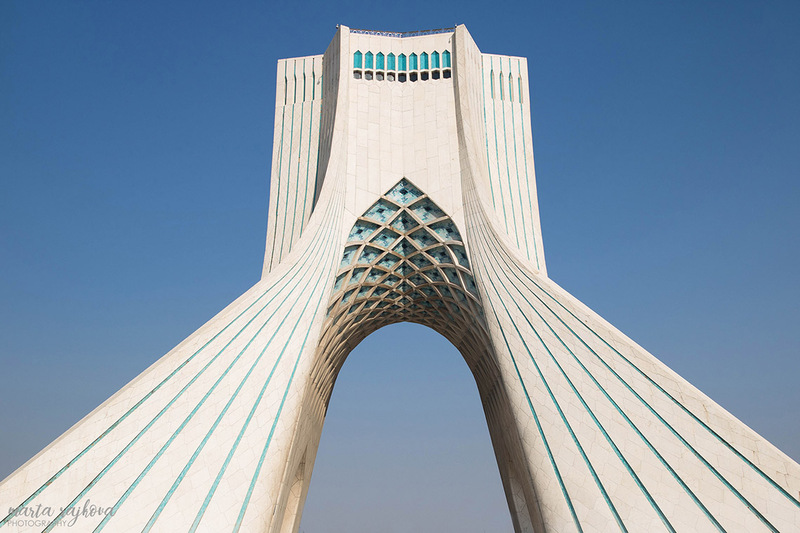 Azadi (=freedom) Tower is a visual icon of Tehran built on 1971 to commemorate the 2500th anniversary of the Persian empire. Originally it was called Borj-e Shahyad, meaning King´s Memorial Tower. 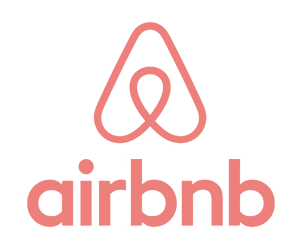 However, after the Islamic revolution the name was changed. The big white structure standing in a nice contrast with the blue sky is quite photogenic. It is worth a short visit if you are in Tehran. My pleasure Akbar. I loved Iran and I dare say it is among my personal top 5 countries I have ever visited in my life. Wowwww. I really enjoyed it . Dobrý deň Janka, leteli sme z Viedne s prestupom v Istanbule so spoločnosťou Turkish Airlines. Thank you for your suggestions and lovely video. My husband is from Iran and I can’t wait to visit. He is from Toudesh, mot far from Varzaneh. Thank you for your nice message, Martha. I am sure you will enjoy Iran a lot! Sooner or later Iran will be a travel destination. It’s diversity of nature and culture to be discovered . Thank you. Iran is already quite busy, actually quite crowded at some places. Still, some other spots are not touristy yet. Therefore, I think this is a great time to visit Iran. Chcela by som sa opytat ohladom letu Mashad- Shiraz. Letenku si si kupovala este doma alebo priamo v Irane? Bola draha? A este by ma zaujimalo, ako dlho si bola Irane? Ahoj Zuzka, vnútroštátnu letenku sme kupovali na mieste v Mashade, v miestnej cestovke. Cez internet sa nám s tým nedarilo. 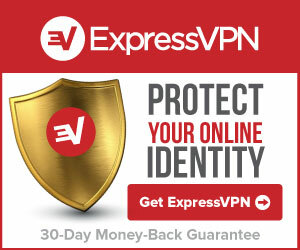 Ak si dobre pamätám, stála v prepočte okolo 60 eur. V Iráne som bola 2 týždne, ale bol to veľmi nabitý program.